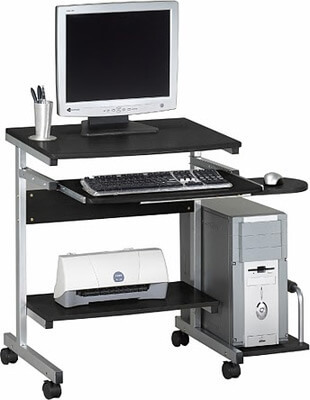 The Mayline Eastwinds Portrait PC Desk Cart. A stylish space saver. Its heavy-duty steel frame is easy to assemble using threaded metal-to-metal inserts to connect to surfaces. Work surfaces have seamless, contoured edges using vacuum-formed thermofoil technology, and are available in Anthracite or Medium Cherry. Adaptable to a variety of environments, the Eastwinds series is perfect for the technology-driven small office or home office.